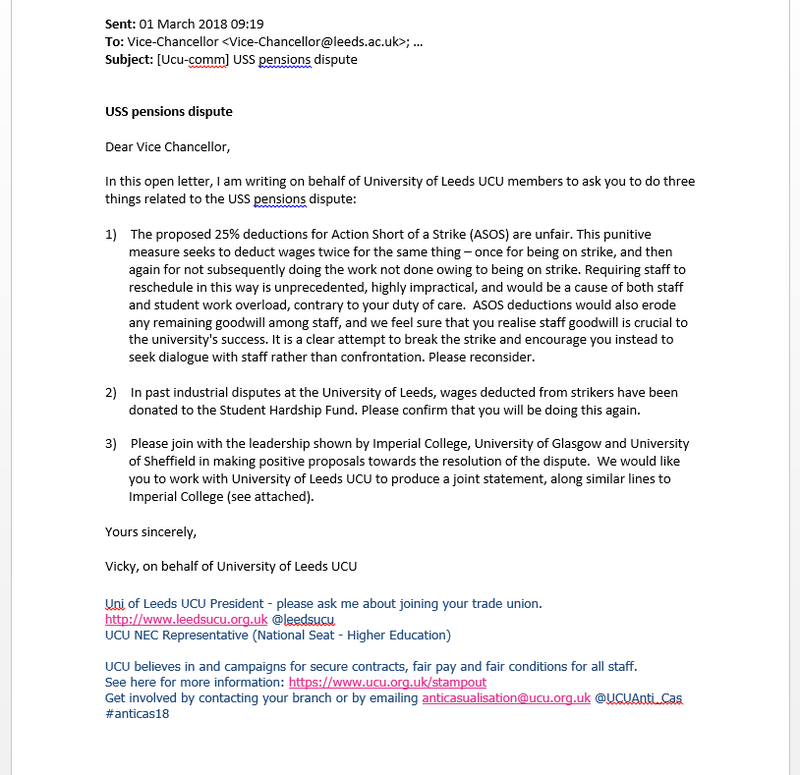 UCU has called on the University of Leeds senior management to drop their punitive, divisive and escalatory plan to deduct 25% from wages for refusing to reschedule lectures or classes, or to cover the work of absent colleagues as industrial action short of a strike (ASOS), and instead, as other university senior management teams have done, to support their employees and work towards a good settlement to the dispute. We have chosen to make this email open. Please share widely. Copy of the HR letter which threatens to deduct 25% of pay. 1) The proposed 25% deductions for Action Short of a Strike (ASOS) are unfair. This punitive measure seeks to deduct wages twice for the same thing – once for being on strike, and then again for not subsequently doing the work not done owing to being on strike. Requiring staff to reschedule in this way is unprecedented, highly impractical, and would be a cause of both staff and student work overload, contrary to your duty of care. ASOS deductions would also erode any remaining goodwill among staff, and we feel sure that you realise staff goodwill is crucial to the university’s success. It is a clear attempt to break the strike and we encourage you instead to seek dialogue with staff rather than confrontation. Please reconsider. 2) In past industrial disputes at the University of Leeds, wages deducted from strikers have been donated to the Student Hardship Fund. Please confirm that you will be doing this again. 3) Please join with the leadership shown by Imperial College, University of Glasgow and University of Sheffield in making positive proposals towards the resolution of the dispute. We would like you to work with University of Leeds UCU to produce a joint statement, along similar lines to Imperial College (see attached). Uni of Leeds UCU President – please ask me about joining your trade union. UCU believes in and campaigns for secure contracts, fair pay and fair conditions for all staff.